Discussion in 'Works-in-Progress' started by DRKV, Aug 1, 2017. MechTransfer is a small mod, that adds various wire controlled devices to interact with items and move them between containers. Below is a list of the added items and their functions. Extracts items from adjacent containers and sends them to a receiving device. Receives items and injects them into adjacent containers. Sends out a wire signal when it receives something. This picture illustrates how you can use an injector and an extractor to move items from one chest to another. You can also inject into and extract from a variety of different different kinds of containers. Currently, the containers from Portable Storage support MechTransfer. Connects receiving devices to sending devices at a distance. Picks up items that land on top of it, and sends them away. Receives items and drops them on the ground. The back of the arrow acts as a receiver, the front acts as a sender. It receives items, and sends them out again. Outputs a wire signal when an item passes through it. The sending device will always connect to the first receiver in line. It will also skip any injectors, that can't inject due to lack of chest space. You can use relays to reroute items to a longer path. Every relay will only receive once per transfer. This prevent things like this, from crashing the game. Acts just like a pipe, but can be toggle with a wire signal. Also acts like a pipe, but it will only let one kind of item through. Right click on it with an item to set the filter. These items can be placed in filters to select a wider group of items. The base filter can be bought from the mechanic, you can use it to craft the other kinds of filter items. This device lets you interact with the items stored in a Magic Storage network. It acts as a storage component. You can access it using transfer extractors and injectors. This thing allows you to access the inventory of a player directly as a storage container. You can take items from it, or even change the player's equipment. Crafts items automagically. 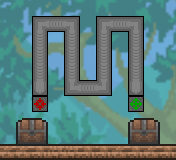 Place ingredients in an adjacent chest, place required crafting station(s) at a max 5 tile distance, activate with wire. You can set the item you want to craft the same way, as with the Transfer filter. The crafted products will be placed back into the chest. This thing might not work all the time, I am still kinda working on it. The turrets can shoot any standard ammo, including every type of bullet and arrow, even modded ones. They can be rotated like vanilla cannons, by right clicking or via wire. The higher tier turrets do more damage and have a faster cool-down. The Matter projector has no cool-down. So, that's basically everything. I'll let you figure out some of the interesting side effects. This was my first attempt at making a terraria mod, and I very much enjoyed the experience, so it certainly won't be the last. I've already got a few things planned. Sorry about the crummy sprites, I am not very artistic. It isn't impossible that I overlooked some major bug, so let me know how it works. It's fairly stable though and probably won't eat your items. The mod is also available through the TModLoader mod browser. putianyi888, BMB, Avamaco and 18 others like this. Can't wait to make a factory with this! Or, just an auto sorter for invasion farms. Important: In order to make these things happen, I gave the Assembler it's own tile entity. (I don't even know why I didn't do that in the first place.) Because of this, after you upgrade, the assemblers that you placed before will not work. You'll need to break and replace them. On the plus side, I cleaned things up, and the download now also contains the source. This mod is so darned cool! With my style of play, it doesn't do a whole lot of help, BUT... It's just so darned cool, that I will find a way to use it. If you want some specific testing done, or whatever, let me know! Thank you, I fixed the crash. I would mostly be interested in how the assembler works with other mods. Items that do special things when crafted could cause problems, especially in multiplayer. Also, what do you think about the crafting recipes? I'm starting to think that the golden keys for the extractor and injector might be a bit too harsh. MilusBR and terraria is awesome 2 like this. One question, does this work with Magic Storage? If not, there's an idea to implement. It doesn't work work with Magic Storage currently, but I'll definitely try to make some sort of interface to access magic storage systems. Cooleo. I have a Mob-Lawn-Mower-Thing-System using multiple mods and I want the drops to go into my storage system, so that's gonna be good. 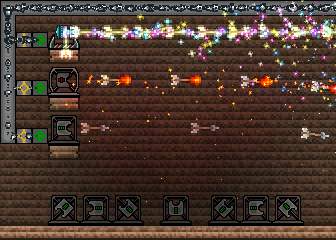 terraria is awesome 2 and DRKV like this. I haven't been playing with mods for too long, so I am not really sure what other mods are doing. I am looking for items that override OnCraft. In the example mod, for instance, It's used to mark items with the name of the player that crafted them. Generally OnCraft should only get called when the local player is holding the newly crafted item. If I call it from the assembler in multiplayer, it runs on the server, and there is no local player. Though I think there is some kind of placeholder, because the example mod didn't crash. I guess I'll keep things as is, and then if there's some serious issue later I'll just add a few safety checks. I'll keep the keys as well, I always end up with stacks of the stuff in hard mode. So, I've started to rewrite things, to make make it possible for other mods to add support for this mod. Thanks to this new system, I was able to make item frames work with transfer device. After a long and fearsome battle, I managed to set up GitHub, so from now on that's where you'll find the source code. terraria is awesome 2 likes this. Yeah, this is not really intentional. I kinda like the idea of storing a bunch of hearts in a chest for later use, although that might be a bit OP. I'm currently working on a bunch of other bug fixes, so I'll figure something out by the next release. storing hearts can make damage invulnerability machines... well... a very inefficient one. dummies and slime mount does it better but still. This version adds support for a few more containers along with some important bug fixes. Turrets now except their ammo from injectors. This way you can fire them automatically, and actually do some damage. Multiplayer should now be fully usable. I really like the whole automatic turret thing. I am also planning to add a turret which can shoot actual bullets/arrows. I think that would be fun. I am not sure about the automatic boss/invasion summoning. I added the Etherian crystal just because it was easy to implement, but I might remove it later. 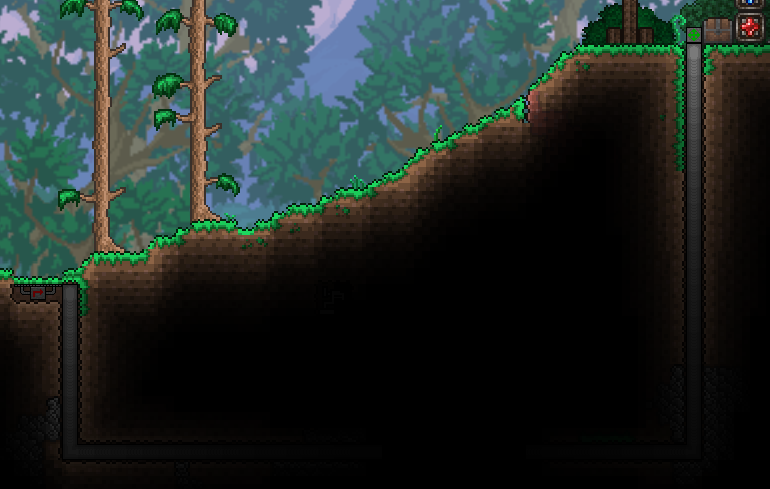 terraria is awesome 2 and Fury like this. I haven''t added any sort of explicit support for magic storage or any other mod jet. I just added the facilities to allow other modders to make their mod compatible with MechTransfer. This feature is not even finalized jet though, and I haven't documented it at all. I will, in the future, try to make magic storage work, by implementing the interface on my end. First however, I want to make the mod more stable, and finish all of the other planned features. This might take a while, as I am currently quite busy with other things. Oh god, I remember the Meinkreft mods that is similar to this...NICE MOD!!!! This version adds a lot of cool things. The main attraction is the new set of turrets, that can shoot any bullets, arrows or other standard ammo types. The turrets currently don't shoot rockets. This wasn't entirely intentional, but I think it's better this way. A misfiring turret with rocket IV would be devastating.